The Paris Agreement entered into force on the 4th of November, two days before the opening of the climate conference in Marrakech. A majority of states had ratified the agreement in their national parliaments. Never before have so many countries joined an international agreement in such a short time – a mere ten months. UN Secretary General Ban Ki Moon praised the determination of the states in the last speech of his tenure at the conference in Marrakech. Shortly thereafter – two days into the summit – the elation vanished abruptly. The clear election victory of Donald Trump – who has called climate change a hoax perpetrated by the Chinese and questioned the gamut of U.S. international commitments – depressed the mood in Marrakech. The well-founded fear that Trump would back out of the Paris Agreement and reverse all of the achievements of his predecessor Barack Obama, or even cancel U.S. membership in the UN Framework Convention on Climate Change (UNFCCC), dominated almost all discussions. The intended broad theme of the conference – climate change in Africa – thus took a back seat. A lot is at stake for the continent: Africa already suffers heavily from the impacts of climate change. African governments are calling for financial and technological support as well assistance in building their capacity for the implementation of their national climate plans – and not just with regard to climate protection, but especially on the much more urgent issue of climate change adaptation. A major portion of the negotiations in Marrakech revolved around interpreting the Paris agreement and spelling out the Paris “rule book” – an operating manual of sorts for implementing the various decisions. Behind seemingly technical and complex issues lurk however highly political conflicts. Specifically, it was discussed how countries should report their respective national efforts in the areas of climate protection, adaptation, climate finance, technology transfer and capacity building to the UN Climate Secretariat and how they can be held accountable for a lack of implementation and compliance. An international register is intended to ensure transparency and comparability in this regard. The negotiations on this issue were tough and emotionally charged: many countries argued that the elements included in national climate plans are voluntary, and that reporting on progress in fulfilling the plan should also be at the discretion of the countries. Furthermore, overly strict monitoring was seen as interference with national sovereignty. The industrialized countries called for all countries to document the concrete results of their climate policy. Many developing countries would only concur if different reporting rules were to apply to industrialized and developing countries. The industrialized countries ruled this out, however. They consider overcoming the division of the world into two country camps as the greatest achievement of the Paris Agreement. The subject of climate justice (“equity” within the meaning of “common but differentiated responsibilities” or CBDR) is thus still far from being eliminated as a bone of contention by the agreements reached in Paris. Another issue for the Paris rule book is the question of how countries can be encouraged to keep their pledges. It is not easily answered in a bottom-up regime such as the Paris Agreement, which relies on voluntary commitments instead of negotiated compulsory obligations under CBDR. The previous agreement, the Kyoto Protocol, still offered some options for action here (even though the whip it cracked was as soft as cotton). In the Paris climate world, compliance must be realized mainly through transparency and accountability. In Marrakech, however, the circumstances of the talks were completely new: The usual categorization of all parties as either developing or industrialized countries under the UNFCCC had been softened by the Paris Agreement. While formally, the division still exists, all countries must now submit nationally determined contributions (NDCs). Unlike under the Kyoto Protocol, all 197 parties of the United Nations Framework Convention on Climate Change thus commit themselves to climate goals – although the developing countries will be depending on generous financial assistance from richer countries to successfully realize them. For international civil society attending the Marrakech conference, one question was particularly important in spelling out the implementation rules for the Paris Agreement: To what extent will it be possible to create the preconditions and access to ensure that the hard-fought, vital language on human rights, gender equality, just social transformation and other key principles in the preamble of the Paris Agreement are embodied in the various implementation steps and instruments such as the transparency framework? And which countries are willing to defend this agenda as human rights champions? Apparently still not enough. Human rights issues only progressed incrementally in Marrakech, for example with references to human rights in the discussions on supporting countries in capacity building or on the inclusion of human rights in the NDC reporting guidelines. By contrast, efforts outside the Paris Agreement for the time up to 2020 to extend a work program on gender and climate change established in 2014 at the COP 20 in Lima were more successful. The program, which was originally planned for two years, was extended by a further three years and its original scope with the primary goal of achieving gender balance in delegations was further intensified and expanded. By focusing on building the capacity of negotiators in all areas of work of the UNFCCC, the work program aims to strengthen gender integration especially in the technical bodies and the financial mechanism as well as through increased accountability of all parties and negotiating bodies in terms of gender mainstreaming. Concrete financial commitments for the implementation of the work program have not yet been made, however. The topics were discussed in a number of groups, such as the “Ad Hoc Working Group on the Paris Agreement” (APA) and various subsidiary bodies (SBSTA and SBI) of the Framework Convention on Climate Change. The “Conference of the Parties serving as the meeting of the Parties to the Paris Agreement” (CMA) also met for the first time in Marrakech. That was mainly ceremonial and a mere formality, however – while the CMA approved some first procedural rules in Marrakesh, real important decisions are not expected under the CMA until 2018. It’s worth noting that the parties to the Kyoto Protocol also met in Marrakech, under the abbreviation CMP. The next true milestone in international climate policy is planned for 2018. Three events will coincide: Firstly, the Intergovernmental Panel on Climate Change (IPCC) will present its special report on the 1.5°C target. The second element is the planned completion of the abovementioned “rule book” for the Paris Agreement. Thirdly, there will be a review of the national goals and measures – the NDCs. One of the objectives of Marrakech was to determine how to ensure that all countries – and especially the developed countries – would refine and raise their previously made commitments at least once. As things stand today, the combined commitments under the NDCs still put us on a path toward an estimated 3°C of warming and are thus contrary to the 2°C and 1.5°C targets. Various milestones exist for the review of the contributions. One of these was the 2016 “Facilitative Dialog”, which amounted to little more than a round of mutual accusations and finger-pointing. The next dialog of this kind, which is scheduled for 2018, will need to be much more comprehensive and better prepared. Particularly worrying in this regard is that the COP 24 in 2018 will once again be hosted by Poland – Europe’s heartland of coal. Then in 2023, the first “Global Stocktake” of the Paris Agreement – a kind of five-year review – will take place. Marrakech saw the launch of\ so-called NDC partnerships, in which industrialized countries intend to help developing countries in the South realize their climate contributions, the NDCs. Countries such as the Maldives, Indonesia and Uganda have professed interest. On the side of the industrialized countries, Germany, France, the United States and Canada offered their help. A long planning period will be needed to pave the way, one country at a time, toward a global economy and lifestyle that respects the 2°C limit. In Paris, countries submitted their goals, while in Marrakech the first ones presented long-term plans for their implementation. For Germany, Environment Minister Barbara Hendricks scored a coup by presenting the very first climate action plan for the year 2050. After putting up with months of bickering at home that the plan was “climate protection lite” and skirted the issue of a binding timetable for quitting coal, the international climate community provided applause in Marrakech. The United States followed Germany’s example a little later by presenting its own climate action plan for 2050 – although this will likely gather dust on the desks of the Trump administration for the next few years. Other countries such as Mexico and Canada followed suit. The weakness of these goals and the subsequent plans is certainly their voluntary nature – which was at first a precondition for concluding the Paris Agreement and could now be very well the key to its survival in the Trump era. The watering down of the German climate action plan by conservative CSU-led ministries, but also by Minister for Economic Affairs and Energy Sigmar Gabriel with regard to the coal exit, shows how difficult it can be even for so-called pioneers to set a course for transformation. Noteworthy in this regard was the announcement by 47 particularly hard-hit countries, almost all of which are members of the Climate Vulnerable Forum (CVF). The countries announced their intention to transition to 100 percent renewable energy as quickly as possible – by 2030 or 2050 at the latest. They were rightly celebrated by civil society and the media for this. The announcement is only a drop in the bucket for the global climate, however, as the greenhouse gas emissions of the CVF members hardly matter on a worldwide scale. Politically, they nevertheless play an important role in the negotiations – even if some observers view their role as weakening a united front of developing countries against the delayed ambitions and unfulfilled pledges of the industrialized countries. Interestingly, the COP 23 next year will be taking place under the presidency of Fiji – in Bonn, however, as the tiny island state lacks the resources to hold such a conference. The agriculture and forestry sectors play a key role in implementing the Paris Agreement, and they were thus the subject of various working groups and discussions in Marrakech. Solutions and instruments discussed there could help trigger a transformation of agriculture, protect land rights and stop deforestation. They could, however, also intensify industrial agriculture and forestry, lead to further evictions of indigenous and local communities, and open new back doors to offsetting fossil-fuel emissions through dubious compensation measures. Much is at stake and the crucial political issues are often hidden behind complicated and seemingly technical items on the agenda. Soils and forests can absorb significant amounts of CO2. However, measures in the agriculture and forestry sectors must not be used under any circumstances to excuse inaction elsewhere. The CO2 budget that the international community set itself in Paris leaves no room for offsets. In other words, industrialized countries will not be able to paper over their lack of ambition in transitioning away from fossil fuels with cheaper emissions reduction projects in developing countries or in other sectors such as agriculture and forestry. The accounting rules of the Kyoto Protocol contained a significant error in the calculation of emissions from the agriculture and forestry sectors. According to the IPCC, it would theoretically be possible to consider the burning of biomass to be carbon-neutral if a separate accounting system were put in place for emissions released during the production of biomass – i.e. during cultivation, harvest, forest clearance and the like. It does not exist in the Kyoto system, however, so that the carbon is emitted but not recorded – neither at the source nor during combustion. Numerous civil society organizations and some countries fought hard in Marrakech to ensure that the accounting rules for recording and reporting emissions in the agriculture sector do not repeat the mistakes of the Kyoto Protocol. Instead, they must ensure transparency regarding the nature of emissions and where they are released, as well as where and how greenhouse gases are once again sequestered in sinks such as soils and forests. Advancing deforestation should not be made invisible by offsetting it with reforestation projects elsewhere. Agricultural emissions of greenhouse gases other than CO2 such as methane should not be hidden by offsetting them with CO2 sequestration in soils. Bioenergy should not be considered carbon-neutral, as the EU would like to see it. Climate protection is about much more than CO2. It is therefore crucial that within the framework of comprehensive transparency and reporting requirements, countries not only state CO2 tons and ton equivalents released, but are also held accountable on how they integrate human rights’ considerations in general, and those of indigenous peoples and women’s in particular, as well as food security and all the other commitments they pledged to uphold in Paris. All of these issues must play a role, not only in nationally determined contributions (NDCs), but also in the joint review in the course of the Facilitative Dialogue in 2018 and the Global Stocktake in 2023. The debate about the risks of integrating the agriculture and forestry sectors in emissions trading is also not new. A key issue in Marrakech was to ensure that the floodgates would not be opened for offsets in the design of the newly created Sustainable Development Mechanism (SDM). An important debate (outside of the UNFCCC, but clearly related and affecting the climate negotiations in Marrakech) concerned the decision of the International Civil Aviation Organization to create CORSIA, a new global market mechanism for aviation emissions. It is safe to assume that the greatest demand for offsets (also from the agriculture and forestry sectors, i.e. including REDD+ offsets) will be coming from the airlines in future. The official climate negotiations on agriculture are quite bogged down, as the conflicts of interest between industrialized and developing countries are simply too great. The major agricultural countries in the G77 group such as Brazil, Argentina and India do not wish to negotiate about agriculture in a climate protection context under any circumstances, but see it solely as a topic for adaptation to climate change. Industrialized countries and the EU see that differently and also want the agriculture sector to contribute to the goal of “carbon neutrality”, i.e. through the problematic production of biofuels – an issue that drew heavy criticism from civil society in Marrakech. Some NGOs called for a work program on agriculture and food security that would cover both climate protection and adaptation while ensuring that the broad goals – no offsets, ecological agriculture instead of factory farms, human rights and socio-ecological criteria – remain clearly in the foreground. However, the negotiations were cut short and postponed until May 2017. Since not a great deal of progress can be seen in national climate action plans at present, the international community is counting on voluntary commitments by the private sector – as it does in so many areas – for climate protection as well. Since the COP 20 in Lima in 2014, the presentation of climate actions by non-actors (in addition to the private sector, these include cities, regional governments and NGOs) have been an integral part of every climate summit. The existing platforms of the Global Climate Action Agenda (involving both the state-driven Lima-Paris Action Agenda as well as the NAZCA climate platform of non-state actors) have been joined by a new one in Marrakech: The “Climate Champions” Laurence Tubiana and Hakima El Haité launched the Marrakech Partnership for Global Climate Action. Its message is that businesses, civil society and policymakers can only solve the climate crisis together. Best-practice examples can serve as mutual encouragement and promote a “race to the top”. Alongside the negotiations – but completely integrated in the venues – a fireworks of announcements took place once again. Among the announcements are always some that are less about protecting the climate than about greenwashing the corporations that bear the greatest responsibility for the climate crisis. Carbon Capture and Storage (CCS) was a big hit in Marrakech – not only as the trump card of the fossil fuel companies for preserving their business models in the low-carbon future, but also as the key technology for generating “negative emissions” that many consider crucial for staying within the 1.5°C limit. In principle, establishing the 1.5°C limit in the climate agreement is a milestone, as it represents a question of survival for many small island states. Meanwhile, many climate scientists believe that we will have exceeded our emissions budget for staying under the 1.5°C threshold in as little as five years. The scenarios contained in the IPCC’s fifth assessment report from 2014 are therefore based on the concept of “negative emissions” (this also applies to a large extent to the 2°C goal already). In other words, the planet will be allowed to warm by more than 1.5 or 2°C, provided we have created enough carbon sinks by the end of the century to make it back under the threshold. Carbon sinks are seen mainly in technological terms – for example in the form of biomass combustion combined with underground CO2 storage (bioenergy plus CCS, BECCS). This, however, would require at least one and a half times the land area of ​​India to cultivate the needed energy crops, which would likely lead to an increase in food prices and land grabbing. A further way of creating carbon sinks would be worldwide, large-scale reforestation, which would also compete with land cultivation for food – and be an ecological disaster, as it would primarily be realized as monoculture plantations. If the idea that we can afford a temporary exceeding of temperature targets were to prevail, it could open the floodgates for all other forms of geoengineering such as giant sunshades or imitating natural volcanoes. This would have barely manageable consequences for the planet and confront us with fundamental issues of democracy: who controls the global climate? Of particular concern is that many problematic approaches amounting to industrial agriculture with monocultures, heavy use of fertilizers and genetic engineering are finding their way into the climate debate via the back door of the Climate Action Agenda. Major agribusiness players are taking advantage of this to present “solutions” such as BECCS and “Climate Smart Agriculture”. As in previous years, climate finance was one of the most controversial issues in Marrakech – one that has been hotly debated since the Copenhagen conference in 2009, when the industrialized countries pledged to assist developing countries with $100 billion annually by 2020. This was intended to help them both with reducing their emissions and adapting to climate change. Rather than promising a rapid, significant increase of the Copenhagen pledge, the Paris Agreement further reduced the responsibility of industrialized countries to provide adequate long-term finance to developing countries and invited all parties to the agreement to contribute to fulfilling the financial commitments. The COP 22 in Marrakech was thus a litmus test of how seriously the industrialized countries would take their financial obligations after the Paris Agreement entered into force, particularly with regard to providing adaptation finance, the eternal stepchild of climate finance. The answer was clear: apparently not very. The OECD countries did in fact finally publish a step-by-step plan of sorts shortly before Marrakech, according to which its public climate funds for developing countries are slated to grow to $67 billion, and ultimately $93-133 billion could be raised by leveraging private funds. Developing countries and international civil society have been calling for such a roadmap for years. However, the optimistic accounting used by the OECD countries drew widespread criticism, which is why the COP 22 decision on long-term financing does not even mention the roadmap and rejects the industrialized countries’ attempt to apply the OECD accounting method to reporting the financial support they provide under the Paris Agreement. And in an “African COP”, as it had been grandiosely touted by the Moroccan presidency, the industrialized countries’ pledge to double the funding for adaptation to around $20 billion by 2020 merely highlighted its inadequacy. When the Paris Agreement stipulated a “balance” between mitigation and adaptation finance, the developing countries were thinking more along the lines of 50:50 than 80:20. For this reason, they called for a quadrupling to $40 billion for measures to adapt to the impacts of climate change. This is a further reason for why the Green Climate Fund (GCF) commitment to allocate than half of its $10 billion in pledges for adaptation measures is exemplary. However, some $2.5 billion of that amount still outstanding from the promised contribution by the United States are now in doubt under a Trump administration. While some new financial pledges for adaptation were made in Marrakech, they were only in the tens of millions, not billions. Germany’s willingness to pledge €50 million to the Adaptation Fund, which is constantly struggling for financial survival, is certainly laudable. However, a truly generous support for adaptation in developing countries looks different. The fact that the Adaptation Fund has to appear hat in hand at the COP, year after year, is symptomatic. It is precisely this fund which has distinguished itself with innovations in support of concrete climate adaptation projects, such as direct access to finance for national institutions from developing countries. The Adaptation Fund was established under the Kyoto Protocol, which expires in 2020, but will now come under the umbrella of the new Paris Agreement – a victory for developing countries. With around $81 million pledged by Germany and other EU countries in Marrakech, the fund’s resource gap is closed for the time being – if only until the next COP? Ultimately, it would be preferable to draw up a long-term financing strategy for the Adaptation Fund. It was originally meant to be funded by a levy on Clean Development Mechanism (CDM) emission reduction certificates. Similar funding support through the new SDM is being considered. Even this, however, cannot be a substitute for a significant increase in public climate funds from industrialized countries for adaptation measures in the already hardest-hit countries. Private funding for adaptation investments, for example by the InsuResilience insurance initiative launched by the German G7 presidency in 2015, can thereby only serve as a complement to, not as a substitute for public funds. The CDM is a UN program that allows industrialized countries to invest in climate protection projects in developing countries instead of reducing emissions at home. Yet, this market approach does not work: Demand for the relevant certificates is barely measurable – a ton of CO2 is currently trading at 40 cents. Revenues from fees on trading are thus insignificant. Also, many CDM projects – such as those involving hydropower or forestry – are controversial. The organization Carbon MarketWatch estimates that only about 40 percent of the declared emission reductions represent actual savings. The resurgence of the debate on the inclusion of CCS projects in the CDM was a further issue in Marrakech. The future of the CDM beyond 2020 is currently uncertain. Another COP focus from the Southern perspective was access to financial resources from the Green Climate Fund (GCF) and other funds. Africa does have several national and regional organizations (from Morocco, Senegal, Kenya, Togo, Nigeria and Ethiopia) that are accredited by the GCF and can access and implement funds directly. However, a large part of the funds continue to be deployed by multilateral development banks such as the European Bank for Reconstruction and Development (EBRD) that also finances fossil fuel exploration and investment projects. The fiduciary and transparency standards that numerous national agencies and organization do not (yet) meet represent some of the greatest obstacles for access. More capacity building as well as a prioritization of national implementing entities via the GCF accreditation process is thus urgently needed. A special focus in Marrakech was on the Africa Renewable Energy Initiative (AREI), a program that was launched in Paris in December 2015 and was even specifically mentioned in the COP 21 resolutions. AREI is under a mandate of the African Union. Its governing board is composed of representatives of various African institutions such as the African Development Bank (AfDB), which also serves as trustee. AREI has set itself the ambitious goal of building 300,000 megawatt (MW) of additional renewable power generation capacity in Africa by the year 2030. At least 10,000 MW are slated to be in place by 2020. Houses in ruins, dead and injured people, destitute survivors – violent storms and floods bring widespread destruction. It will no longer be possible to avoid the effects of man-made climate change completely, even with radical measures, but only to mitigate them. Climate-related loss and damage is already a reality for millions of people all over the world. While money cannot compensate all of the damages and destruction, the question of who is going to foot the bill for them nevertheless comes up more and more often. Developing countries in the global South are bearing the brunt of this devastation. However, the climate funds that have already been promised to them are in fact earmarked for other purposes – for reducing emissions and adaptation. Yet “loss and damage” pertains to precisely those consequences of climate change that can no longer be prevented by adaptation. The UN member states have been arguing for years whether additional dedicated funding is required for this purpose. Specifically, at issue in Marrakech was the future of the Warsaw International Mechanism for Loss and Damage (WIM). It was adopted in the Polish capital in 2013 and is now due for a review. While the industrialized countries would have gladly checked it off quickly, the developing countries wanted a detailed and thorough review process. They will get it, but not until 2019. At least it was decided that the WIM must also deal specifically with the issue of funding for losses and damage as of 2017 – a major breakthrough that many industrialized countries had resisted fiercely. 2017 will therefore hopefully give new momentum to this important environmental issue – not least because of the presidency of the small island nation of Fiji at COP 23. Fiji is all too familiar with loss and damage caused by climate change: In early 2016, cyclone Winston killed 44 people and destroyed 40,000 homes, as well as critical infrastructure such as schools, ports and power lines. North Africa is already struggling with numerous consequences of climate change. The coastline is threatened by rising sea levels and erosion, while desertification is on the increase. The climate is becoming drier and hotter, yet when it rains, the downpours are frequently so heavy that sewers cannot cope. Cities and entire regions are being flooded ever more frequently. Crops are destroyed and economic activity grinds to a halt. The population, however, scarcely sees a connection to climate change, as Moroccan environmentalists lament. The COP 22 in Marrakech has at least given civil society climate activities a modest boost. Three days before the COP, international activists met with numerous Moroccan groups at the “Change the System, Not the Climate” conference in Safi organized by Attac Morocco. In this city in the Marrakech region, the air, soils and coast have been heavily impacted by pollution from the cement, sand and phosphate industries. In the “Déclaration de Safi”, the groups call for fossil fuels to remain in the ground and emphasize that the effects of climate change reinforce the social inequality of local people, particularly of women. This message has not yet arrived at the parliamentary level, however: Morocco has thirty parties. Only around a dozen usually make it into the parliament – and not one of them has environmental and climate protection on its agenda. By contrast, the significance of environmental policy is growing in Tunisia, another country in the region. Interest is increasing within the political parties for the new policy field that can be used to address issues related to the quality of life in cities and industrial regions. There are also a growing number of civil society initiatives on environmental protection, resource policy and, since the Paris summit, climate policy. Climate activists are by now also building networks throughout the Mediterranean and the Arab world. One example is the Ain Soltan Call of Mediterranean Youth. Before the Marrakech summit, the Tunisian Organization RAJ brought together young NGO representatives from both sides of the Mediterranean. The appeal, signed by participants from France, Spain, Italy, Tunisia, Egypt and Algeria, calls for greater transparency in the makeup of delegations, more civil society influence, better communication of national climate plans at home, concrete adaptation projects, and last but not least, more thorough preparation of and a strategy for negotiations. The final point was particularly significant in Marrakech in light of the influence that the savvy negotiators from Saudi Arabia traditionally exert on the other Arab states. While the oil state wants to diversify its energy mix by 2030 and adopted the Paris Agreement just before the COP, Saudi Arabia still appears to be playing for time and blocking climate policy progress among Arab countries. By contrast, a country such as Tunisia that would have much to gain in the negotiations was represented by a single climate diplomat. Away from the COP tents, activists from around the world came together in Marrakech in the “Espace auto-geré” (autonomous zone) to exchange ideas. The result was a fiery call for climate justice, the 1.5°C target and 100 percent renewable energy – combined with the human right to a healthy environment. The participants focused mainly on local movements such as Stop Pollution, a group in Gabes, Tunisia, which is organizing opposition to the chemical and phosphate industry. They allied themselves in Marrakech with anti-fracking groups in Ain Salah in Algeria and Imider in Morocco, as well as movements better known in the West such as Standing Rock in the United States and Notre Dame des Landes in France. Morocco went to great lengths as the COP host and its organization of the conference was a success. Its role as the climate and energy policy pioneer of the Maghreb and Africa was particularly noticeable in the energy sector. However, in meeting the supreme royal goal of transitioning the country’s electricity supply to renewables as quickly as possible, social and ecological considerations are clearly taking the back seat in projects such as the Ouarzazate concentrated solar power plant. The future will show whether the electric Ubers and bicycles will remain and whether the numerous calls to protect the environment on billboards throughout the country have an effect. Success must also be measured by the extent to which the people are included in these projects. With its Marrakech Action Proclamation, the COP presidency wanted to leave its own mark on the summit. Initially, several developing countries expressed concern that the document could involve a process similar to the one that caused the 2009 negotiations in Copenhagen to fail. At that time, the COP presidency coordinated the Copenhagen Accord with a select few countries in parallel to the arduous official negotiations efforts. In Marrakech, the fears soon proved to be unfounded. The proclamation, however, contains little more than warm words and grandiose confirmations of commitments and promises already made. For the international community, it is important to know that all states are behind the Paris climate agreement. Even if Marrakech was not a breakthrough summit, it did maintain the momentum of Paris. What remains – also in view of Trump’s election – is the message that we will continue to move forward together. This text was created in cooperation with KlimaJournalisten UG. The authors are grateful to Kate Dooley, Alden Meyer, Julia-Anne Richards and Hans Verolme for valuable input and opinions. 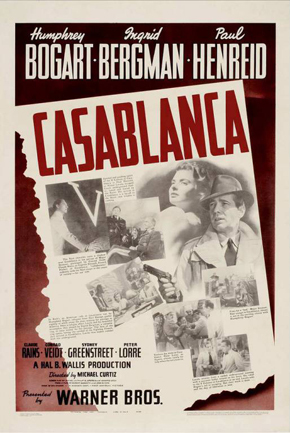 All Headlines are quotes from the movie "Casablanca". The UN climate conference in Warsaw was the COP with the lowest expectations ever and lived up to that in every respect. What were the issues discussed and decisions taken? Who is to blame for the stalemate?